The Conservation Scorecard provides an overview of the 2018 legislative session around the environment. 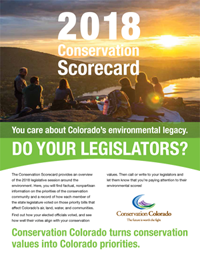 Here, you will find factual, nonpartisan information on the priorities of the conservation community and a record of how each member of the state legislature voted on those priority bills that affect Colorado’s air, land, water, and communities. Find out how your elected officials voted, and see how well their votes align with your conservation values. Then call or write to your legislators and let them know that you’re paying attention to their environmental scores! Conservation Colorado turns conservation values into Colorado priorities. You — our volunteers, members, and supporters — made our victories possible in the 2018 legislative session. This massive effort from our community helped us achieve some big wins this year. We were able to make progress for Colorado by investing in our great outdoors, expanding the use of recycled water, and increasing energy storage at home and on the grid. But many common sense conservation measures were blocked, including bills that would have better protected children from the impacts of oil and gas development or reduced carbon pollution. Meanwhile, this legislative session, we saw many of our core values threatened. Five male legislators faced sexual harassment allegations, sparking a review of workplace policies at the Capitol and resulting in the expulsion of a sitting Representative. The Colorado Civil Rights Commission was nearly defunded by lawmakers playing politics with the rights of lesbian, gay, bisexual, and transgender people. And immigrants faced painful attacks by legislators pushing regressive policies that would harm families who love this country and are working hard to build their lives here. Even as these emotional controversies colored the session, the conservation story remained the same for yet another year. Bold policies to protect our environment and way of life were shut down, reminding us once against of the need to elect pro-conservation leaders. With a pro-conservation Senate, House, and Governor, we can fight for our land, air, water, and communities. As we approach the 2018 election, we need our supporters more than ever. Together, we can win and ensure Colorado remains a leader in the West and across this country.